YAMAHA U3H-MADE IN JAPAN+10 YEARS WARRANTY+TUNING+SERVICE SUPPORT FOR 10 YEARS+BENCH-WHAT IS STOPING YOU? ASK ANYONE TO MATCH UP PRICE WITH SERVICE TO BEAT THIS OFFER!!! 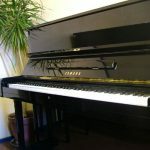 AFTER COME AND SEE WHAT CONDITION PIANO WE HAVE, HOW MUCH JOB IT IS ALREADY DONE(PAID MORE THAN $1000 FOR REGULATION, POLISHING, ADJUSTMENT, TUNING THREE TIMES). COME AND TRY!!! Size : 131cm height,158cm wide.